DJO Global is a leading manufacturer of bracing, physical rehabilitation devices, orthopedic equipment, and pain management products for physicians and athletes. Today, DonJoy braces are standard equipment for both orthopedic physicians and competitors all over the world. Donjoy braces are routinely used by professional and NCAA athletes for competition and recovery after injury. DME-Direct is proud to carry the full line of braces, supports, accessories, and Donjoy products for injury recovery. Below, you'll find categories for every Donjoy brace including knee brace models along with braces for shoulder, wrist, and ankle conditions. 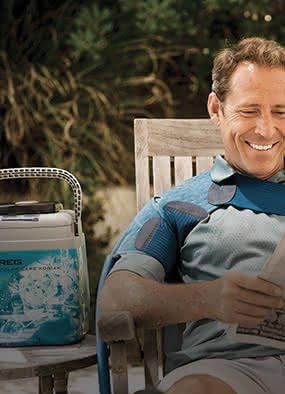 We also carry cold therapy and an extension variety of Donjoy bracing accessories for functional braces. DME-Direct warehouses the complete Don Joy selection of DJO Global products including products from AirCast, DonJoy, Procare, Chattanooga and Saunders. Our customer team is filled with physical therapists and athletic trainers that know every Donjoy® brace and can give you the best price, service, and a full DJO Global bracing warranty. We're proud to guarantee many of our Donjoy and Aircast items in stock vs. the competition - Order your Donjoy brace with complete confidence today.